Looking for a fun Christmas Party activity for your holiday gathering? Look no further.. Play Holiday Hold'em! If you have children, you can play a non-betting version of this poker game. You play for points and top point earner wins! Or you can play any card with thm. Having all adults? Use the cards and hold a Holiday Hold'Em tournament! It couldn't be any easier. Here's how we assigned the points for the non-gambling version! Each Santa logo is one of the suites in the card deck! 2. Choose a dealer! The dealer goes one by one with each player. Two cards are dealt to the player, three cards are placed on the table. The player may elect to keep one or both of the cards in front of him. He may also turn them back in to the dealer in hopes of getting a better hand. The goal is to get a hand that is worth the most points. For example, you may have 3 of a kind between your 2 cards and the dealer's three. You may opt to keep those points or try your luck at turning in one or both of your cards in order to get a hand that is worth more points. 3. Each person finalizes their hand and the total points is noted on the score sheet. After 3 rounds or however many you want to play, the points are totaled and a winner is declared for this fun You may elect to choose runner ups also. Prizes can be anything you want. Some of our family favorites: CASH; gifts cards, instant lottery tickets, or the most sought after prize: a "Holiday Hold'Em CHAMP" t-shirt proclaiming the winner. I make these myself using this logo. Making your own t-shirts is so easy using eitherAvery T-shirt Transfers for Inkjet Printers, 8.5 x 11 Inches, for use with White or Light Colored T-shirts, 6 Sheets (03271) if your t-shirts are a light color or these Avery Personal Creations InkJet Iron-On Dark T-Shirt Transfers, Five Sheets per Pack (03279) ones if you are making dark, colored t-shirts! You print your picture and text onto these sheets and then iron on to the t-shirt! They are a highly sought after prize in our house. Just be sure to read the directions CAREFULLY, it is an easy process but do read and make sure you are printing and ironing on correctly! Here is a whole page we created with a tutorial for for making your own tshirts . Happy Holidays from our home to yours.. here is the free printable deck of Holiday Hold'Em cards! 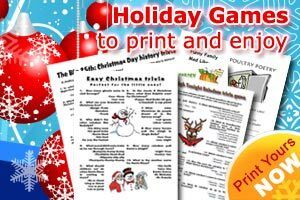 Here is the complete set of Holiday Hold'Em playing cards, scoring sheet and instructions.. just print and play! And YES, this Christmas party activity is free! It's our gift to you!!! More Holiday Ideas you may like here! A Christmas activity for the kids.. Jingle the neighborhood!